There is a new online petition called Votch that can be signed in support of stopping the protocols from being signed/ratified. You can sign the Votch petition here. On a related note, US-based readers can also send a letter to their congressmen to push for a vote in Congress on the Armenian Genocide Resolution, H.Res.252. Click here to find out how. This means Turkey is ready to go through with it despite repeated calls for a resolution to the Nagorno-Karabagh issue before the protocols can be signed. One is lead to believe that the peace deal make come through by October 10, or Turkey is simply desperate to push the protocols through to resolve the Armenian question once and for all. The sooner the protocols are signed, the sooner that international Genocide recognition will be irrelevant, especially with the formation of the historical commission to determine whether genocide indeed occurred. There won’t be any claims for land reparations either. Then with Armenia playing ball, Turkey will incorporate it under its hegemony and socioeconomic sphere. Russia won’t care about Armenia anymore since it is forming tight bonds with Azerbaijan. In the meantime the Armenian nation will fade into the twilight of assimilation, thereby erasing the Armenian identity. Say goodbye to the Republic of Armenia within the next 50 years. Armenians will become a classic textbook case of a forgotten people. It will be a true demonstration of genius on the part of Turkey. That is, assuming the protocols are ratified. Am I wrong? Somebody write a comment. 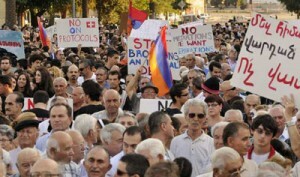 Armenia Liberty reported yesterday that grape farmers in the Ararat valley are protesting against the fall in wholesale prices being paid out to them by distilleries based there. Seems that the factories are reneging on signed contracts that they would pay 130 dram per kilo of grapes and now insist that they will only pay 80 dram because of high crop yields. This breach of contract naturally angered farmers there and they assembled in Ardashat, the administrative center of the Ararat region, to wage their protests. Apparently the issue has become so heated that President Serge Sarkisian himself is about to intervene to find a solution,which obviously should be that the factories should honor the contracts. As things stand now cognac and wine making factories are already making a killing, placing high prices on their products while paying small change for grapes harvested by local farmers, most of whom are operating small businesses. The quality of the grapes are very high, as can be ascertained as soon as you pop a few in your mouth–they explode with flavor and the taste lingers for several minutes. They sell the same sorts of grapes used to produce wine in the markets, so it’s not difficult to for anyone to sample them. I have long believed that farmers need to unionize and stand up to the distilleries and packing companies because what they are being paid out is simply too low, there can be no doubt about this. Tomatoes are bought for as low as 60 dram (about 6.3 cents) a kilo wholesale while they are sold in the markets for triple the price, which is still very low. This is ludicrous. Farmers must be allowed to make a profit, they can’t break even or even lose money on their production, which does happen. Never mind that they are toiling away cultivating their land, trying to make a buck in an already well-rooted capitalist system they are still struggling to cope with. They have a right to earn a living with dignity. And now they are standing up for their rights. Yesterday Former Foreign Minister Vartan Oskanian, who now heads his Civilitas Foundation based in Yerevan, delivered a speech in the Yerevan Hotel about his take on the protocols calling for Turkish-Armenian diplomatic relations. 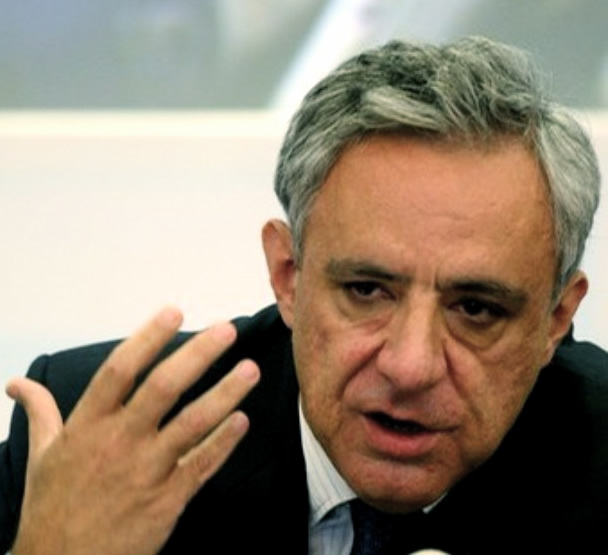 The text is both passionate and straightforward as he explains without mincing words what the consequences will be for Armenia should the protocols be signed under the current circumstances. I have conveyed some of these thoughts in previous posts on this blog and in private, but I haven’t touched upon some key issues that he raised, namely the lack of a normal, functioning democratic system in Armenia. Below are some highlights of his speech. We are facing a critical historic and political decision as a country and as a people and Civilitas believes in the importance of public debate. But in the case of these protocols, the debate is going off in the wrong direction. Not only are we presented with a fait accompli, but they’re also telling us nothing is changeable, and those documents have no preconditions. Reading these protocols one unwillingly comes to the following conclusion: That these documents were prepared, somewhere, with Turkey’s participation, and imposed on the Armenian side, or the Armenian side really did negotiate this document having fully convinced itself that Armenia’s future development and survival is indeed completely linked to the opening of this border. Those are the only two possible explanations. Otherwise, it’s not possible to understand the logic of these documents that unequivocally give Turkey what it has wanted for 18 years. Let’s not fool ourselves, let’s not mislead our people, let’s not trample on our own dignity, and let’s call things by their name. For a moment, let’s assume that the border will indeed open. We will, as a nation, have to recognize that the border is being opened in exchange for important concessions of history and national honor, and of our sense of who we are and how we view our role and place in this region. We will have conceded our equal place in our future relations with Turkey. At the base of this document is a defeatist attitude. It reminds me of the mood in 1997, when we were being told Armenia has no hope of further development, that it can’t be a stable, fully independent state if the Nagorno Karabakh conflict is not quickly resolved. The next 10 years came to disprove this. Despite the many problems and faults of that period, with the border still closed, there was in fact serious economic improvement. Our economy saw double-digit growth thanks to old and new economic reforms and their continuation. The country became more stable, with a new sense of unity, however fragile and incomplete, and with broader Diaspora inclusion. We must have trust in our own resources, in our people, in our country, in our future. If we successfully completed first generation economic reforms, we must move on to the second, third, fourth, fifth generations. These hold huge potential for our prosperity. We have an ever greater potential source: our unity and common sense of purpose. Despite all this, there is also a new area where no one — not past administrations and not this one either – has seriously and honestly ventured. Very little has been done in the thorny but vital area of political reform. Unfortunately, our state is not a democratic state yet. But our whole future and security depend on that one word. We have not invested in fortifying and consolidating our democratic institutions, and now instead of going forward, we are going backwards. Our people, any people, are creative when they are free; but we have not created the conditions, the equal playing field, an assured rule of law society that protects the freedoms that enable prosperity. The closed border has not kept them out. Our succeeding governments have not nourished the seeds that are here on our land. Signing these documents will not solve our problems. On the contrary, they will bring on entirely new setbacks and problems that can only be tackled by a unified, free, hopeful society. For 15 years, Turkey has maintained the blockade, hoping for our economic and political capitulation. It didn’t happen and will not happen. Today, it is they who desperately need to come out of that political corner in which they placed themselves, it is they who need that border open, and they seem to have found a way to do it, at our expense. Today, they need to open the border. It is they who are under great European pressure within their accession time frames. Today, they need to open the border because they are the ones who have economic issues at their eastern border that they need resolved. Today, they need to open the border because they are the ones in fear of the genocide recognition process that has been moving quickly and has culminated in great US pressure. Finally, they need the border open in order to reinforce their leadership role in this region. I cannot find any fault in what he underscored as I have been thinking along the same lines since the diplomatic “framework” was revealed last April. But I don’t know how many people are actually paying attention to this argument against the protocols. There are opinions circulating that Armenia has no choice but to open to border for Armenia’s continuing economic growth and stability, which is certainly hard to believe—one stroll across Yerevan’s several districts will tell you something different. Another argument is that President Serge Sarkisian is essentially being blackmailed to approve the protocols by foreign governments who want to see the border opened for their own geostrategic and economic interests in the region, otherwise information that can be held against him (and ruin him) will come to light. In other words, he may be saving his own skin rather than protecting his country’s statehood. I am realizing that this pertinent make-or-break issue facing the Armenian nation is not about economics, it’s about trust. And Turkey is showing no signs whatsoever that it can be trusted at all, especially with overtures made by Turkish Prime Minister Tayyip Erdogan that the Nagorno-Karabagh issue must be resolved before the protocols can be ratified, not to mention the insistence that Armenia recognize the current border established under the Treaty of Kars. It is Turkey that should have extended a hand to open the border, which it closed in 1993, not Armenia. Yet the Armenian authorities are doing everything possible to show their willingness to forge diplomatic ties, despite loud protests from its own people, without properly analyzing what the future could hold in store. This narrow minded short-sightedness is a clear indicator of complete irresponsibility from the Armenian side which can lead to irreversible consequences should the protocols be formalized. And time is running out to stop this precarious process. According to RFE/RL the Turkish newspaper Milliyet has reported that the protocols are scheduled to be signed on October 13. Incidentally that is the date when the Treaty of Kars, which defined the present day border between the two countries, was endorsed. Apparently history is symbolically repeating itself to the date. The agreements will most likely be signed in a neutral country and not in Turkey where Armenian President Serge Sarkisian is due for a visit to watch football next month on October 14th. Maybe in a gesture of “goodwill and in pursuit of peace, mutual understanding and harmony” as the protocols stipulate, the Turks will let the Armenian team win, but don’t count on it. Interesting times we are living in. Let’s see what the Armenian nation will decide by the day before the protocols are supposed to be signed (this could be a ploy, they could always be signed in secret sooner).